In 1942, magician Paul Curry invented a card trick that would take the world of pasteboard sorcery by storm. Dubbed Out of This World, this effect, where a spectator separates the red cards from the black ones without looking at them, featured a very rare combination of an extremely powerful effect with an almost self-working methodology and quickly became the most talked-about card trick of its time. 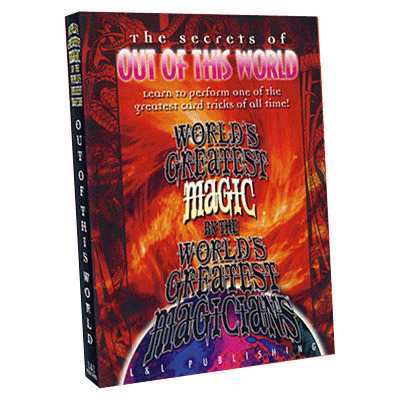 On this DVD, you'll meet five different performers who each has a singular take on this classic trick. Michael Ammar is first with an easy-to-perform version that echoes Curry's original method. Steve Draun is next with a streamlined version that eliminates any packet switches in the middle of the effect while David Regal takes the Curry methodology a step further, with the spectator not only separating the cards by color but by suit, also! Glenn Falkenstein uses a classic Triumph-like effect to set the deck up for his version of Curry's miracle while, finally, Eugene Burger offers some thoughts, not just on the methodology, but more so on the presentational aspects of the trick.